Yi Qun Xu | The Chamber Music Society of Lincoln Center. 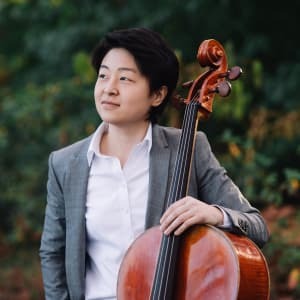 Cellist Yi Qun Xu, a native of China, has performed extensively as a soloist and chamber musician across the United States. She has been invited to many festivals, including the Perlman Music Program, Four Seasons Music Festival, Heifetz International Music Institute, Kneisel Hall, Music@Menlo, Olympic Music Festival, and Orford Arts Center. She came to the US after studying with Yi-Bing Chu at China’s Central Conservatory of Music, where she won multiple top prizes in Chinese national cello competitions. Additionally, she has received many honors including first prizes at the 2017 Eastern Connecticut Instrumental Competition, the 7th Antonio Janigro International Cello Competition in Croatia, the ASTA National Solo Competition, the Wellesley Concerto Competition, and second place at the Juilliard Concerto Competition. A passionate chamber musician, she has collaborated and performed with many artists including Itzhak Perlman, Ani Kavafian, Ida Kavafian, Ralph Kirshbaum, Hsin-Yun Huang, Mark Kaplan, Tessa Lark, Merry Peckham, Jon Kimura Parker, Itamar Zorman, and members of Cleveland, Juilliard, Tokyo, and Ébène Quartets. She studies with Timothy Eddy at The Juilliard School where she is the proud recipient of a Kovner Fellowship. Ms. Xu studied with Laurence Lesser and Ronald Leonard at New England Conservatory Preparatory and the Colburn Conservatory of Music.